As the Channel Manager at LivePerson, responsible for the Partnership with SAP, my colleagues and I are excited about the launch of LivePerson’s integration into the SAP Cloud Platform Portal (see previous blog written by David Resnik). LiveEngage is available for download now on the SAP App Center and opens our LiveEngage platform to B2B / B2E use cases, to help businesses communicate with suppliers or employees or both, via messaging, in a way that is conversational and continuous. In this blog I explain what conversational commerce really means and how, in 2018, LivePerson launched its conversational builder and used Rich Media to transform messaging into conversational commerce. Our intention – to bring brands closer to their consumers, with even greater levels of satisfaction and efficiency. What is conversational commerce and what’s all the fuss about? Conversational commerce makes it easy for consumers, employees and suppliers), to communicate with brands from any device, on their own schedule, using natural language to get answers to their questions and get things done. It’s the key to achieving LivePerson’s mission to make life easier by transforming how people communicate with brands. People need to interact in order to transact. They have to ask questions, get advice, and understand options. Conversational commerce makes it possible to do just this without having to visit a store or call a contact center. As people, we are already conversational. 90% of conversations with friends, family, and colleagues take place through messaging, while 18 of the world’s 22 most popular smartphone apps include messaging. And most millennials choose messaging over the phone in almost all scenarios. Conversational commerce makes it easy for consumers to reach brands or other teams in the way they prefer to communicate. How does LivePerson power conversational commerce? LiveEngage is the platform that powers conversational commerce. It orchestrates humans, bots, and systems through an integrated set of services. In real time, LiveEngage can understand intent, route conversations to the right agent (bot or human), manage agent workload, queue conversations, understand conversational sentiment, and uncover trending topics. LiveEngage uses Rich Media including photo sharing, audio messaging, carousels, quick replies and structured content cards so brands can serve more use cases over messaging whilst making the whole experience conversational. It allows businesses to communicate with customers seamlessly across numerous messaging channels including websites, SMS, mobile apps, Facebook Messenger, whatsapp, google RCS and Apple Business Chat. 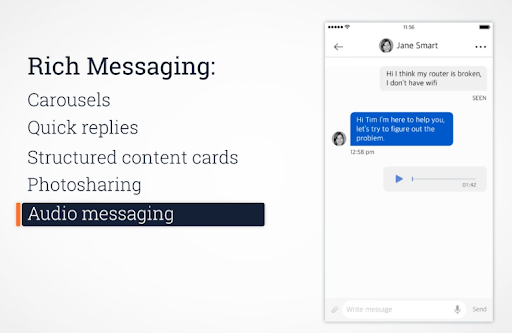 This video summarises the top LiveEngage capabilities introduced in 2018 to transform messaging into conversational commerce. In addition to messaging, LiveEngage allows brands to radically expand their reach through conversations using new tools and capabilities that focus on automation to scale conversations, leveraging machine learning and AI. The use of chatbots automate routine tasks and frequently asked questions and enables messaging to scale. The problem with AI and bots to date has been that automations can be complex, with heavy reliance on developers and involved integrations. LivePerson’s Conversation Builder, launched in 2018, is a dialogue-based tool for creating automated conversations at scale, which requires minimal to no code. As reliance on development is reduced, agents, who are closest to consumers, can participate in creating and adjusting automations. Throughout 2019 LivePerson will develop pre-packaged dialogues for the most common workflows, such as product search, order status, FAQs, bill pay, scheduling appointment etc. – making an already easy to use Conversation Builder even simpler. 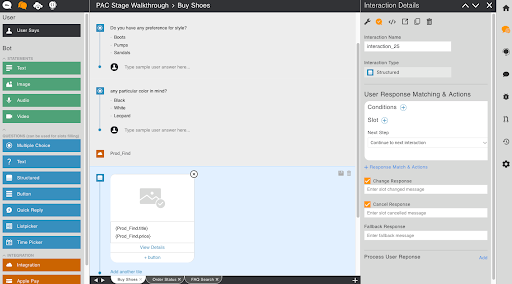 Other LiveEngage features to power conversational commerce include advanced contact center management tools such as queue prioritization, smart capacity and enhanced messaging dashboards. LivePerson helps brands scale all the interactions they receive through messaging, currently helping over 180,000 customers communicate with brands to ask questions, buy things and get help, using their preferred messaging service. 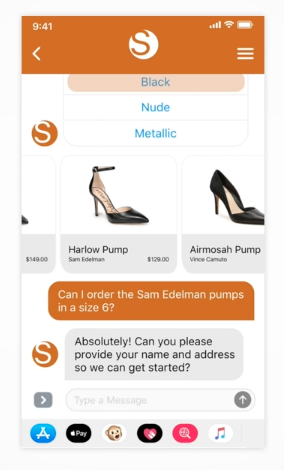 With conversational commerce and tools for automating conversations and making them increasingly rich, brands are beginning to shift volume from expensive, cumbersome voice and web channels to conversational interfaces, meeting consumers, employees or suppliers where they’re already comfortable, driving huge efficiencies and high customer satisfaction. Take a look at our LivePerson listing on the SAP App Centre, to learn more.